5 days per week, including weekends, opening hours vary according to the time of the year. Please refer to our opening times and info on tandems.co.uk for further details. Follow the A65 towards Kendal, Gargrave is located approximately 4 miles from Skipton town centre. 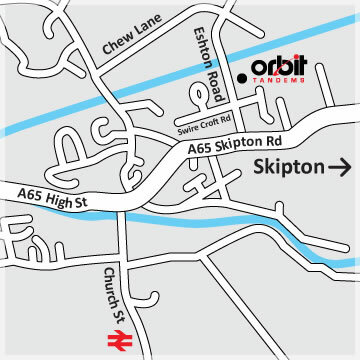 Upon entering the village take the turning right sign posted to Malham, our showroom can be found on the industrial estate, about 200 yards from the main road, on the right hand side just before the canal.